Gamblogger: Compete with other players for $120,000 in casino bonuses & try new I Zombie slot at Intertops Casino! 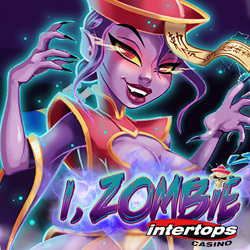 Compete with other players for $120,000 in casino bonuses & try new I Zombie slot at Intertops Casino! 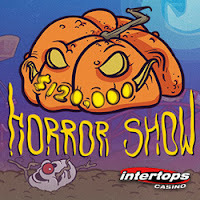 This month, Intertops Casino is giving away $120,000 in prizes during its Horror Show bonus contest. $30,000 in Horror Show prizes will be awarded every week until November 5th. 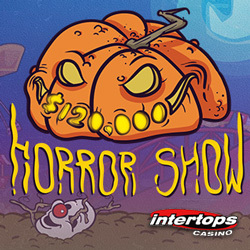 "We're looking forward to some seriously spooky fun with this new game," said Intertops Casino's manager. "And I have an eerie feeling there's going to be some deadly competition for the top prizes in our bonus contest this month!" You earn points at Intertops Casino when you play any of the casino's slots and table games on your desktop or laptop computers or in the mobile casino on your smartphones or tablets. Every Monday until November 5th, the 300 players with the most points win bonus prizes -- up to $500 each. The top 20 each week are also entered in a $1000 final draw. This is a cash prize with no wagering requirements. This contest rewards frequent players, but even occasional players can win random draws on Thursdays. To make this month even spookier, the undead are rising in the new I, Zombie slot from Realtime Gaming. When Wilds or Scatters appear, they can reveal additional Wilds in other positions on the reels. Scatters -- a mysterious magical Mirror -- trigger the Free Spins feature. During free spins, every time Wilds appear they reveal more Wilds and all prizes are doubled or even tripled. Until October 21st, Intertops is giving deposit bonuses up to $500 with up to 50 free spins on the new game. Available until October 21, 2018. Wagering requirement 30X deposit + bonus, 10X for free spins. Intertops Casino has been entertaining players for more than twenty years and is one of the oldest and most trusted online casinos in the world.